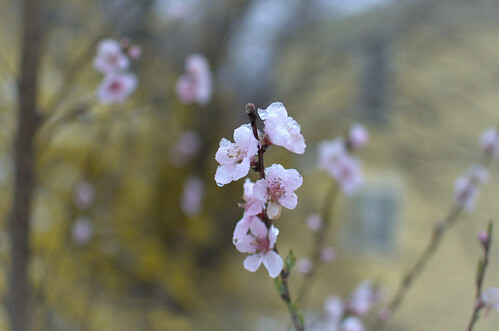 peach blossom, a photo by jahansell on Flickr. I can't remember the peach tree ever blooming this early before - seems like it's usually mid-April. I wonder if the peaches will be early too? The tree is about four years old now, and the new branches on top went up about 20 feet. I'm sure I should have pruned them a month ago but I ran out this morning and lopped off a few. There are still a few tall ones with a ton of flowers - I'll never be able to get up that high to harvest the fruit! Early blossoms are in danger when the nights are so cold again in France !